In today’s age most people will experience some sort of tooth decay. Detecting tooth decay early is vital to tooth health and is important in mitigating other, more expensive tooth restorations and procedures in the future. Restorative dental procedures fix all types of tooth decay, whether that is simply a cavity filling or something more extreme like a root canal. Be sure to call Dr. Barberee’s office to schedule an appointment for tooth restoration. We offer many restorative dental procedures to help give you a smile you can be proud of. Tooth decay has developed and has led to a small hole in the tooth, called a cavity. If the cavity is small enough and the decay has not spread very far, we can resolve this issue with a filling. The dentist will remove the areas of decay on the tooth and fill the area with a silver amalgam filling or a composite resin one. Composite fillings have become more popular in recent years as their appearance is matches natural tooth color very well. Inlays and onlays are an advisable alternative when tooth decay becomes more severe. More advanced tooth decay that has led to the tooth losing structural integrity. Tooth decay will be removed just like when a filling is done, except in this case more of the tooth will need to be removed. Once the decay has been removed, the dentist will make a mold from your teeth. The mold will be sent to a laboratory to create the inlay or onlay. The inlay or onlay will be cemented and create a completely durable and reliable restoration. Porcelain has become the preferred choice for this procedure as it is very strong and matches your tooth’s natural color. When tooth decay becomes more advanced, your only other option might be a crown. Teeth that are broken, decayed, or have become very weak might require dental crown work. Crowns are great because they maintain the natural look of your teeth while covering and protecting it completely. Crowns are typically made of porcelain, but sometimes people opt for a gold crown. Porcelain crowns are natural looking and are virtually indistinguishable from the rest of your teeth. Gold crowns pose no risk of chipping or cracking and might be a good option for teeth in the back of your mouth. Teeth that are severely decayed might require extraction. This leaves bridges or implants as alternative treatments. Patients who are missing a tooth, or several teeth, may experience certain day-to-day difficulties like chewing and speaking. Missing teeth might eventually lead to jaw problems that are harder and more costly to treat. Fixed bridges can improve the appearance of your teeth that restores your smile and provides a more permanent solution compared to dentures. 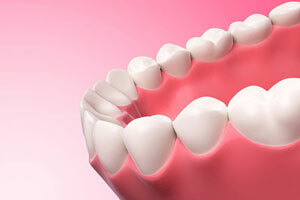 Bridges work by placing artificial teeth where your missing teeth once were. The dentist will take a mold where the tooth (or teeth) is missing and send it to a laboratory to fabricate the bridge. The bridge will be set into place and the artificial tooth is cemented to the adjacent teeth. This restores the natural appearance and repairs the normal functionality of your teeth. If you choose a resin-bonded bridge, the artificial tooth is secured by a metal appliance. The metal appliance attaches to the backs of adjacent teeth, creating a secure and natural feel. The remaining alternative are dental implants, which are permanent and are not reliant on the surrounding teeth for functionality or support. The inside of each tooth is filled with pulp. The pulp carries the tooth’s blood supply and is home to all the nerves. If bacteria gets in to the tooth by way of a crack, chip, or deep cavity, then you might experience pain and the death of the tooth. When performing a root canal or endodontic therapy, the dentist will remove the pulp that has been affected and replace it with a rubber sealant. After the pulp is removed, tooth is then covered with a crown. This crown protects the tooth from further damage and restores comfort and functionality. Root canals have a bad reputation, but our office will make sure your procedure is successful and worry free.. The only viable alternative to endodontic therapy is a complete extraction.